WEST PALM BEACH — The School District of Palm Beach County has annouonced the Outstanding School Volunteers for the 2014-2015 school year. The award recognizes a youth, adult and senior volunteer based on length of service, type of contribution and characteristics of services performed. This year’s winners are Sarah Palumbo of Boca Raton, Kelly Kupi of Boynton Beach and Clara Carrazana of West Palm Beach. They were honored at the Dec. 17 School District Board Meeting and are eligible for state-level honors. They will also be recognized at the Volunteers & Business Partners Recognition Event this spring at the Kravis Center in West Palm Beach. 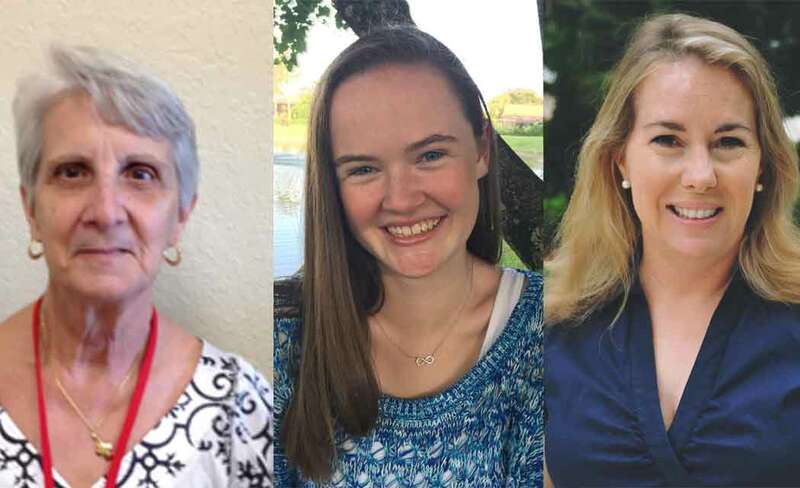 Sarah Palumbo, who has been named the youth volunteer, began volunteering through the National Junior Honor Society when she was a student at Eagles Landing Middle School in Boca Raton, where she served as a peer tutor. The Boca Raton teenager created and continues to run the Kids in Need program, which requires her to contact businesses and community members about donating school supplies and backpacks. She also has helped to collect more than 4,500 toys through a “Toys for Tots” drive that she started three years ago at Eagles Landing. She served as PTSA student affairs liaison and earned the 2012-2013 Palm Beach County PTA Student Ambassador Award. “I am always inspired at the change that one small action can bring,” said Palumbo, 15, a Florida Atlantic University High School sophomore who was nominated by Eagles Landing Middle. Supporting environmental initiatives, such as assisting in the school’s outdoor learning center and working as an advocate for Eagles Landing to be designated a green school, is also part of her impressive roster of accomplishments after four years as a student volunteer. It’s also in her genes – Sarah’s mother, Kendra Palumbo, won the adult volunteer award for the 2011-2012 school year. Kelly Kupi, a mother of three who lives in Boynton Beach, has been named the adult volunteer of the year. She began donating her time approximately 20 years ago, first at the Gulf Stream School and now at the Alexander W. Dreyfoos Jr. School of the Arts in West Palm Beach, which nominated her for the honor. “You start out volunteering because you want to do for your kids, and then you really get inspired when you see all of the teachers giving so much extra time,” said Kupi, whose daughter is a senior at Dreyfoos. Kupi serves as Project Graduation chair, co-chair for the Back to School Lunch, Holiday Luncheon and Appreciation Week for Teachers/Staff, is the auction adviser for the Visual Arts Parents Association, and is known as a fundraising dynamo for numerous causes, including students who need help paying for online ACT and SAT workshops. Kupi averages 20-plus hours a week at Dreyfoos, where she helps conduct the annual college fair, an event she founded nearly four years ago that now attracts more than 2,000 students and parents. When she’s not working as the parent administrator for the Edline website, she’s busy with “Project Grad,” which she jokingly calls a full-time job because of its many committees and fundraising duties. Clara Carrazana of West Palm Beach is the senior winner. Carrazanna spends 20 to 30 hours a week at Gove Elementary School in Belle Glade, which nominated her for Outstanding Senior School Volunteer, a category for volunteers 62 years and older. Affectionately called abuela or abuelita – the Spanish word for grandmother – by children and faculty alike, Carrazana started volunteering when her daughter, who is now a college student, attended Gove. In addition to working with small groups in the Spanish kindergarten classroom, she monitors breakfast in the cafeteria, chaperones field trips and assists with clerical duties. In addition to recruiting other parents and seniors to be volunteers, she is quick to notice when a youngster needs school supplies, a clean uniform shirt or simply an encouraging pat on the back.